The Gujarat government also called in paramilitary forces to control the situation. Mobs blocked roads in the towns of Unjha and Visnagar, after which curfew was imposed. 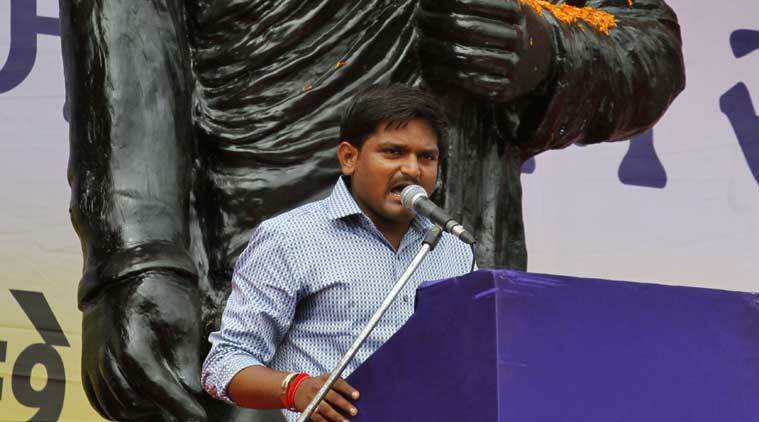 Violence was reported from across Gujarat on Tuesday evening after the police briefly detained Patidar Anamat Andolan Samiti (PAAS) convener Hardik Patel and lathicharged his supporters at the rally venue. Hardik was released a couple of hours later. By then, three police chowkies had been set ablaze, and the residences of state ministers Rajnikant Patel, Nitin Patel as well as BJP MLA Jayshree Patel had been attacked in Mehsana. Curfew has been imposed in Mehsana district and Surat. All schools in Ahmedabad have been declared shut on Wednesday. “We are terribly disturbed with what is happening in the state,” said Additional Chief Secretary, Home, P K Taneja. The trouble began soon after the rally, when Hardik proceeded to sit on a hunger strike. Police said the protesters only had permission to hold a rally at the GMDC ground till 5 pm, and asked them to vacate the place. When the crowd resisted, police resorted to a lathicharge to disperse them. Read Also: What do the Patels really want? “Dozens of people sustained injuries as the police started wielding batons,” said an eyewitness. At least five mediapersons were also injured in the police lathicharge. On hearing about the lathicharge, those who were returning from the rally to their districts reportedly blocked roads. The Vadodara-Ahmedabad expressway was also blocked, resulting in a traffic jam that stretched for over 10 kilometres. The BJP’s headquarters in Patan was attacked, the collector’s office in Gandhinagar was stoned, and incidents of bus burning and chakka jams were reported from Ahmedabad, Rajkot, Surat, Gandhinagar, Mehsana and Vadodara. Mobs torched a public bus in Bhuyangdev area, pelted a fire brigade team with stones and vandalised a BRTS bus at Gota. Stone pelting was also reported from Chandkheda, Naroda and Bapunagar areas in Ahmedabad. In Ghatlodia, people were reportedly dragged out of their homes and attacked. Late in the night, violence also broke out in Kapodara, Varachha and Pandesara areas of Surat, reportedly after a functionary of PAAS withdrew support. There were reports of clashes between protesters and the police in Pandesara, Surat. Blaming the police for the lathicharge, Hardik appealed for peace on local television channels. Chief Minister Anandiben Patel also sent out an appeal for peace. PTI quoted Joint Commissioner of Police R R Bhagat as saying that the lathicharge would be probed, and action would be taken against those involved in it. Earlier in the day, the rally took a violent turn as clashes ensued between the Patels and the police, following an altercation between the rallyists and residents in Juna Wadaj area. According to reports, the trouble began after groups of Patels on motorcycles, wielding sticks and swords, tried to enforce a bandh. Police had to resort to lathicharge and lobbed teargas shells to bring the situation under control.